September | 2018 | Dublin Construction Co., Inc.
Freudenberg Texbond, LLC is an International Company based in Macon, Ga . This manufacturing operation processes waste plastic into Non-Woven reinforced base sheeting. 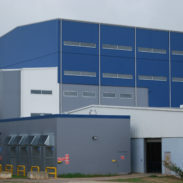 The new structure was built inside and through the top of an existing facility. The project was completed in May 2017.